WHAT, where did January just go? How are we at the end of the month already? We have had a busy month and that’s probably why it has gone so quick. Plus I was poorly with a bug that wiped me out for pretty much the whole week, I soldiered through but didn’t eat much just drank water – great for the diet though. 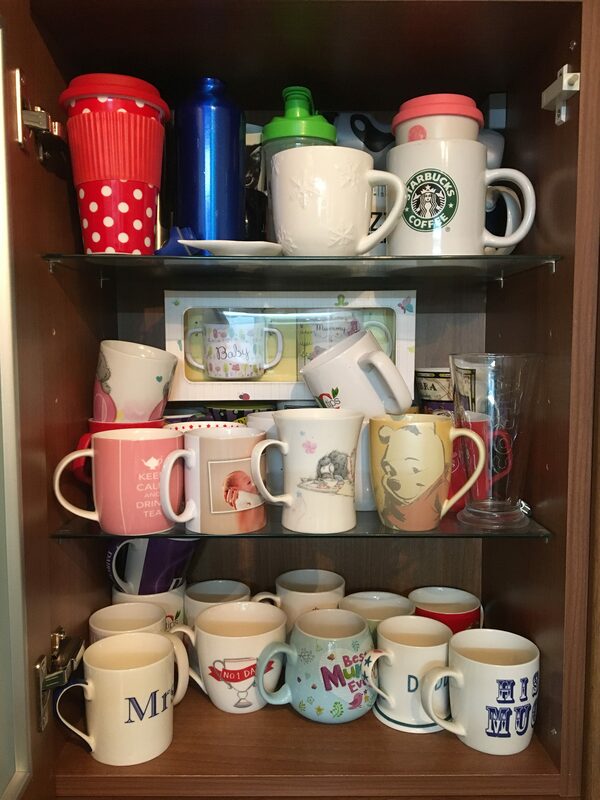 Our kitchen cupboard is over flowing with mugs of all different shapes, colours and sizes, yet I only like to use a few of them, the rest get pushed to the back to gather dust. 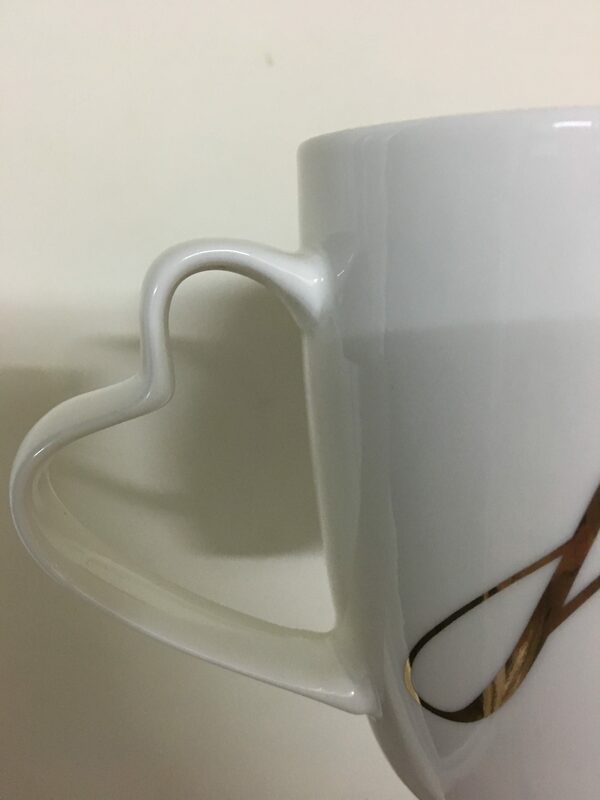 Here are my favourite mugs that I have collected so far. We were gifted a set of these as a wedding present and we both said how nice they are. The handle is the perfect shaped to hold it securely and easily. 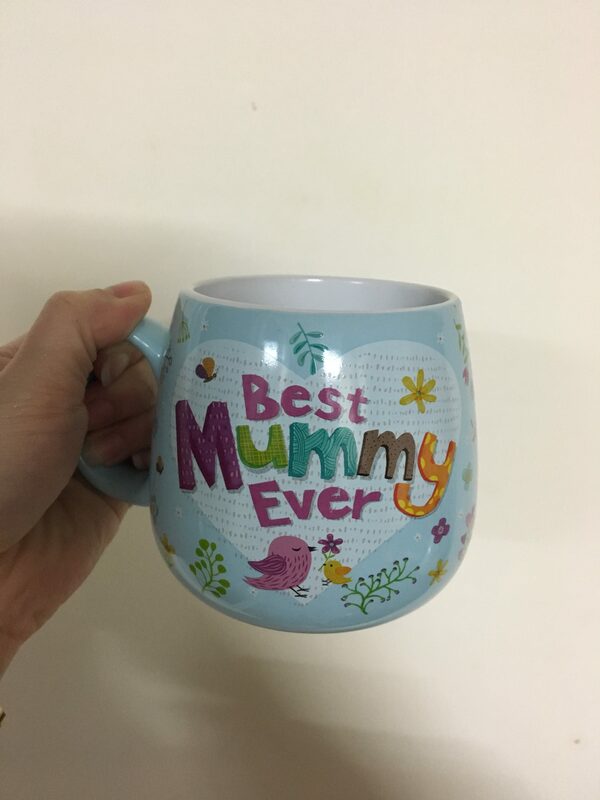 My mum brought me this from our little boy for mother’s Day as a little extra gift from him, even though my husband had brought me gifts. It came with a matching coaster and I love it. It is a little on the big side and heavy but I still love to use it every day. 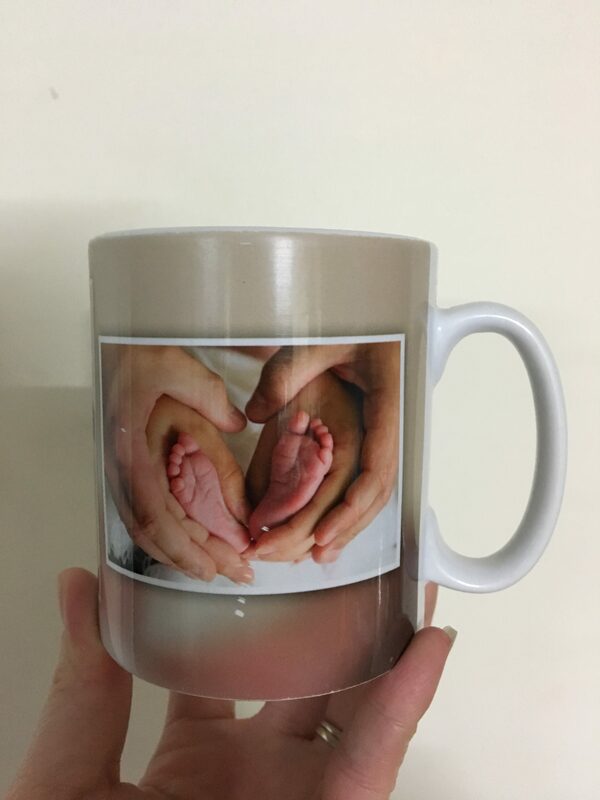 This mug was the first mug I received with all 3 of us on it. I love it, it was included in a review here. 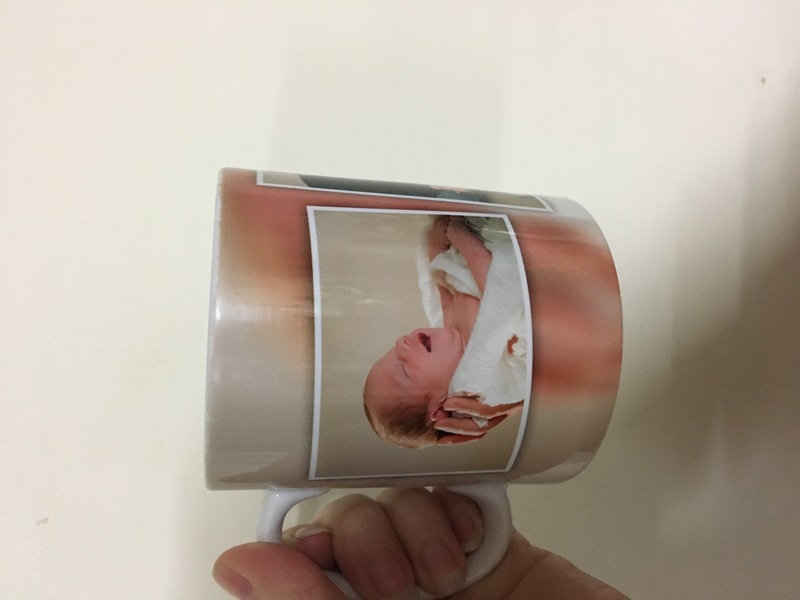 My nephew brought me this mug a few years ago now, so it is special to me. 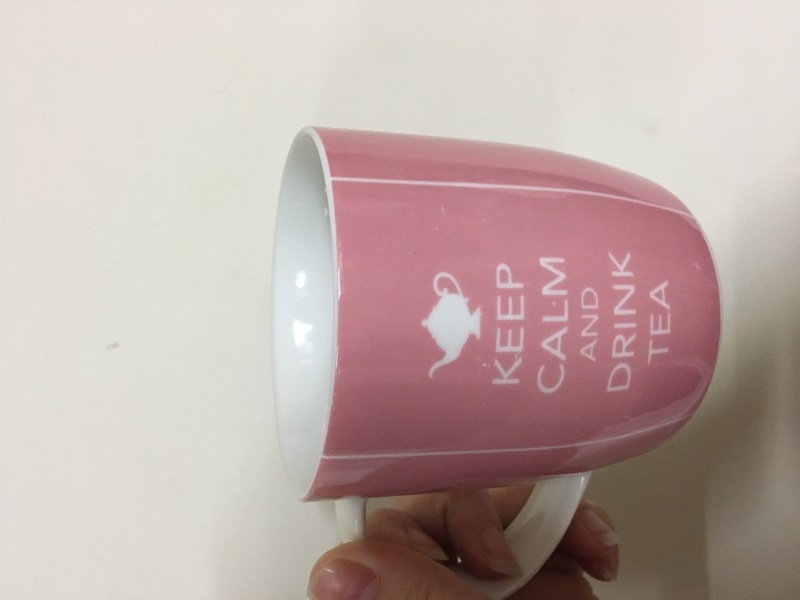 I love Tea and drink quite a lot when I’m at work daily so was very appropriate for me to purchase this mug. I brought the set of these for me and hubby after we had our little boy from next. 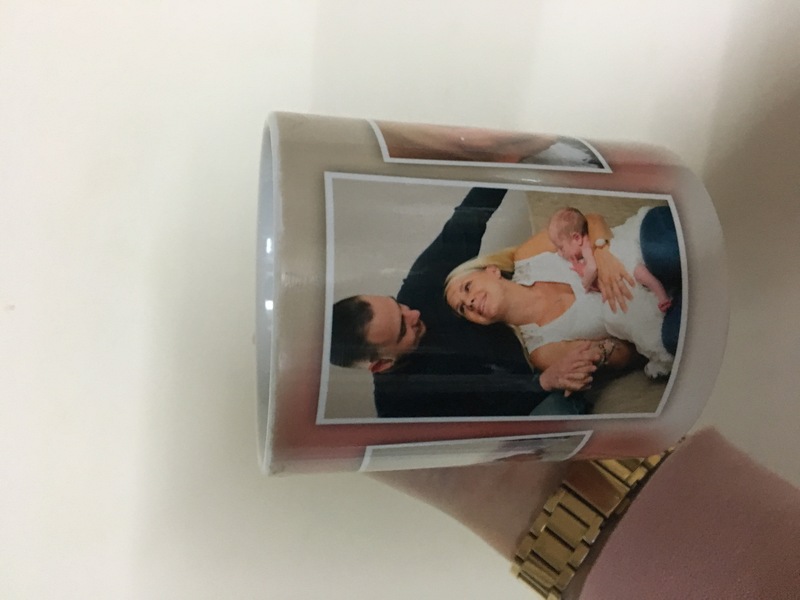 It’s a small and lightweight mug perfect for those spare 5 minutes you might have to yourself while baby is sleeping. So there you go my favourite mugs to drink Tea from. 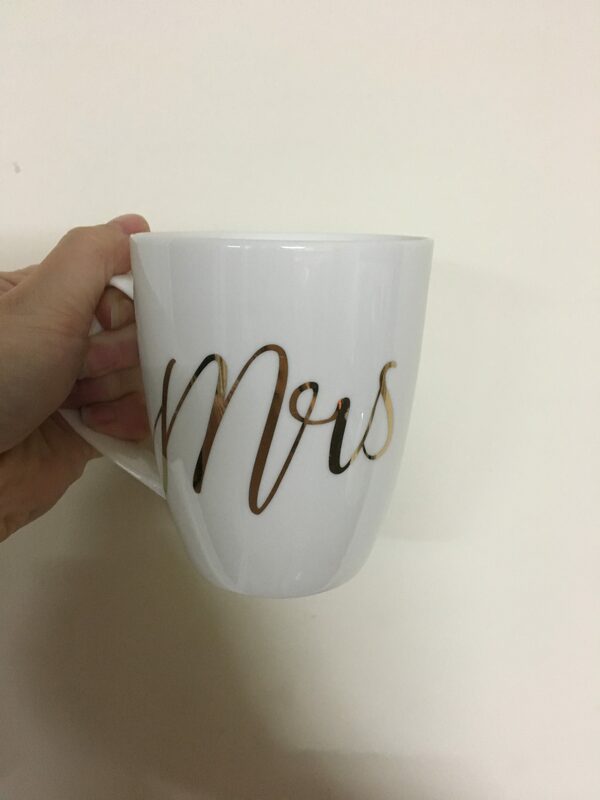 DO YOU HAVE A FAVORITE MUG? OR DO YOU JUST GRAB WHICHEVER MUG IS AVAILABLE FIRST? Another week that has flown by. Christmas is just a distant memory now it’s seems a long time ago to me. We haven’t really changed our eating habits but are just trying to make our portions smaller and so far it is working well. We’ve lived in our home 4 years now, and in those 4 years we have done so much to the house, decorating, rewiring, building work, and a new bathroom last year and more but one thing, and the most important to me is photos. We hardly had any photos up around the house of us, our families or nieces/nephews. A house to me is a not a home without memories in the way of photos, so I changed this immediately and decided on creating a photo wall in the lounge. I wanted all the photos in one place for everyone to see when they visited our home, the first picture frame I ordered was the “Daddy” frame for Father’s Day here and we have built it from there. I then brought the “Freddie” and “Mummy” frames a few months later to make the set complete, but yet to still fill them with photos. We built the rest around them in no particular order, and still have Christmas photos from the last two years to frame and put up. We did have loads of photos but none were printed out as we’ve never got round to it. The large middle frame my husband gave me for my birthday it’s a professional photo shoot we had done a few months before. I want to change the end one of the 3 of us at our pre wedding photo shoot as my husbands head is chopped off. We have got new additions to add of Freddie’s first nursery photos. 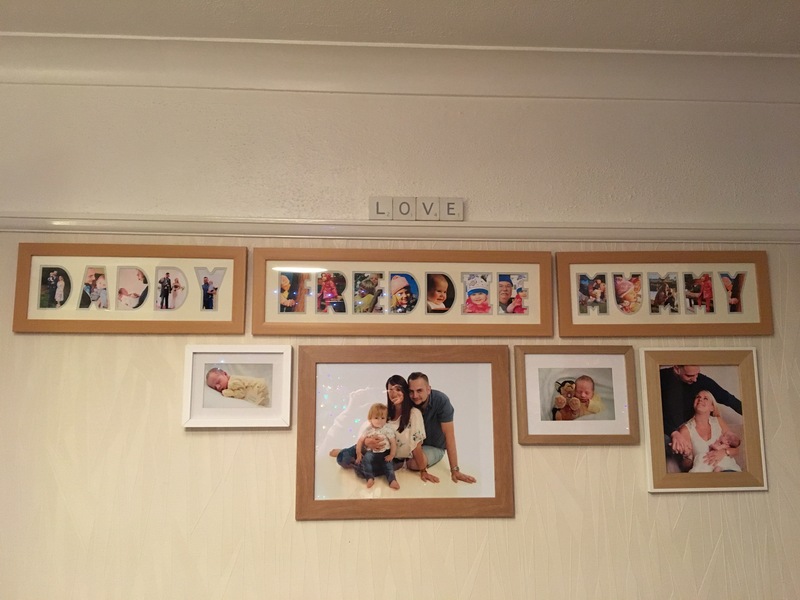 Have you got a photo wall in your house? would love to see yours for inspiration. Hands up if you actually enjoy vacuuming? I don’t! I can’t say it’s ever been one of my most favourite jobs to do, lugging a vacuum every which way wherever you need it to be, finding or been able to access a plug socket, doing half a room before having to unplug and plug it in somewhere closer to get it to reach into those hard corners. We had asked for one for Christmas from my parents, the continual thought of dragging one up and down the stairs until we could save up for a decent one had filled me with dread, but it’s no longer something I need to worry about. 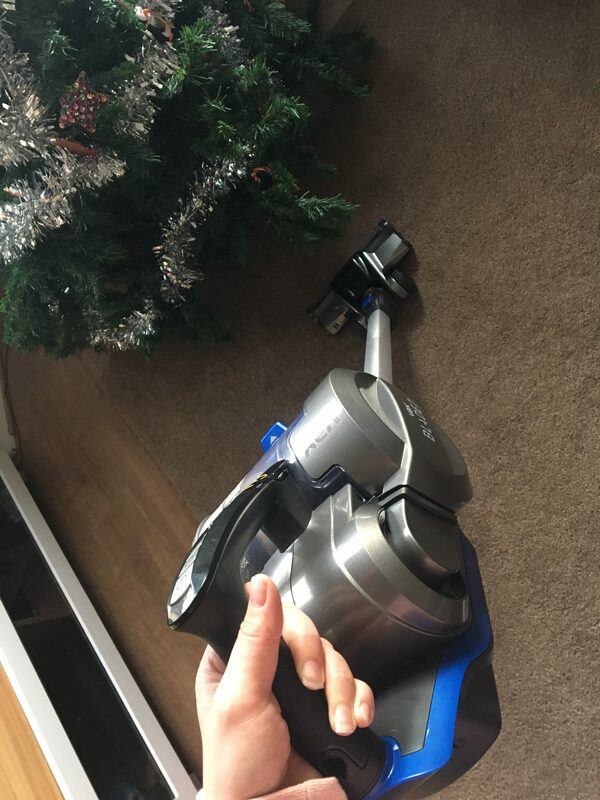 With having a dog that is forever malting and a toddler who throws/drops food everywhere I wanted a vacuum I could quickly whizz around the house daily. We were given the Vax blade 2. The Vax Blade 2 is cordless, so I don’t have to worry about any cables getting in the way anymore. The part I hated the most was doing the stairs and trying to balance the vacuum while trying to clean, now that has gone and it so much easier. It’s as powerful as a conventional vacuum. It takes four hours to fully charge and gives you 45 minutes cleaning time – more than enough time to do the whole house. There are lights on the handle to let you know how much power is left and lights when the brush is rotating to allow you to see what’s on the floor. 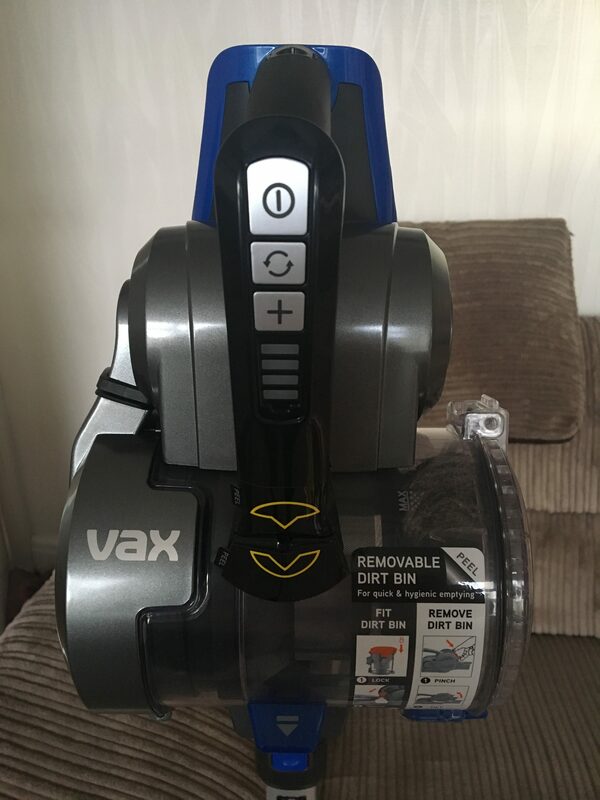 We use it with the long pole attached to do the laminate throughout the downstairs and the carpets upstairs, but also included with the vacuum was a selection of other attachments to do other jobs. It retails at around £200 and is well worth every penny. I would highly recommend this vacuum. We were given this product as a Christmas present. However all words and opinions are our own. These weeks are flying by again, we have had a good week but a little boy who most of last week was teething, even though he was happy in himself his bottom told us otherwise, it was red and extremely sore every time we changed him and trying to clean him he would really cry and flinch, I felt like the worst mum ever. Have you got back on plan since Christmas? A lustrous fur coat is something to be loved and valued for the treasure that it is. Real fur has been a constant since the beginning of human civilization and its allure continues to this day. Getting a fur coat is a pretty big deal – we all know how costly the good ones, even the decent ones are. So how do you ensure that your precious new garment does not get damaged or experience wear and tear so easily? Fur coats remain the most enduring fashion pieces for the winter season. Apart from coats, you can opt for more casual garments like parkas, vests, jackets, and capes – these can be worn with your favorite denim and winter boots. Men’s collections would include more neutral tones. Jackets and strollers made from fox and mink are very popular nowadays. When it comes to the fur type, beaver and mink are the top choices because of the warmth and soft texture. If you want something higher in the luxury spectrum, lynx fur is a great choice. Buy your fur from reputed stores who can provide a complete range of services – from retail to storage. FurClearinghouse.com is one of the top fur sellers with a very large selection for men and women. Major fur cleaning should be done by a furrier but you can always remember some basic tips so you can take care of your garments at home. Fur can collect a lot of dust and debris, so a good shake helps. Do it in a place where you can sweep up the floor easily – outdoors is even better. Do not fold fur garments like coats or vests and they should always be hanged to maintain the shape. Brushing techniques for fur are also different. You can also use ground coffee beans to remove odors from the fur garment. Storing fur requires a bit of precision and care. Temperatures cannot be too humid or dry as that will upset the balance of natural oils in the fur. These are the oils that give the fur its inimitable luster and texture. Fur is also susceptible to being damaged by vermin. Small insects can nest in the fur, destroying it and rodents too can damage your fur to the point of no repair. So any storage solution will have to address all these issues. Professional furriers guarantee the best care for your valuable possessions. Services include not only storage and cleaning but also the maintenance of the garments. Fur houses are equipped with the tools and expertise to help condition your fur garments and replace the lost natural oils. Their storage facilities are climate-control environments which cannot be replicated in your closet at home. Fur houses can also help restyle your older furs into trendier versions. Fur is an attractive and durable material that adds a glamorous quotient to your winter wardrobe. Take care of your fur coats so they always look fantastic when the season comes. To build my blog up, schedule more posts, have more contents and manage it better overall. 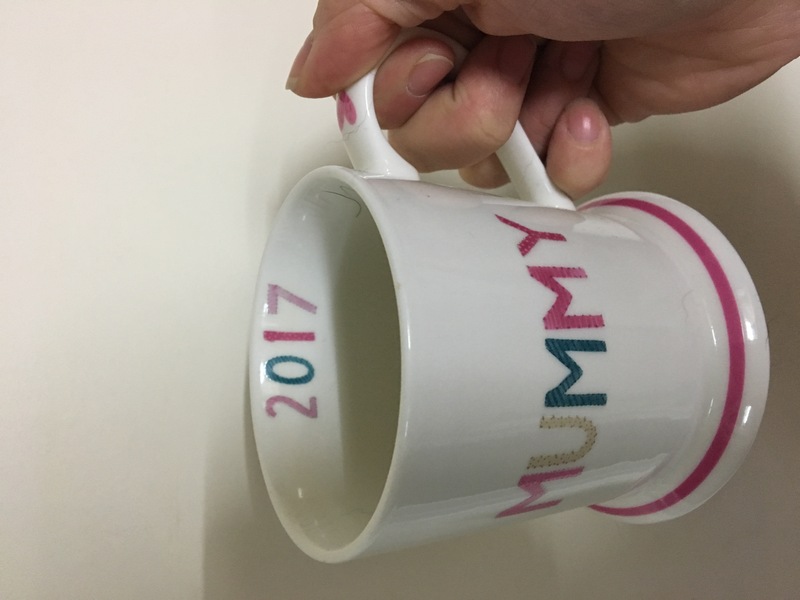 With going back to work full-time after maternity last year I have struggled to keep on top of everything. Keeping along the same line as point 1, I want to aim to build up my handcrafted card stationery business I have been making cards for a number of years now, and with making my own wedding invitations back in 2017, and a friend’s Wedding stationery in 2018 it made me realize how much I want to expand. One day maybe be able to be self employed and working for myself to be able to have more time at home with my family and more flexible working hours. I need to drink more water and will be aiming to just drink water aside from my several flasks of tea a day , I just forget to drink it. Now on to the health theme I’d love to lose weight this year. No, I will lose weight this year. I have tried for many years but never succeeded. I’m adamant to try to lose my baby weight as we’ve got two holidays abroad this year and want to feel confident in my bikini, but we’ll see how it goes! Exercise more, I walk every day to and from the train station but I want to try and do more such as running or general keep fit. 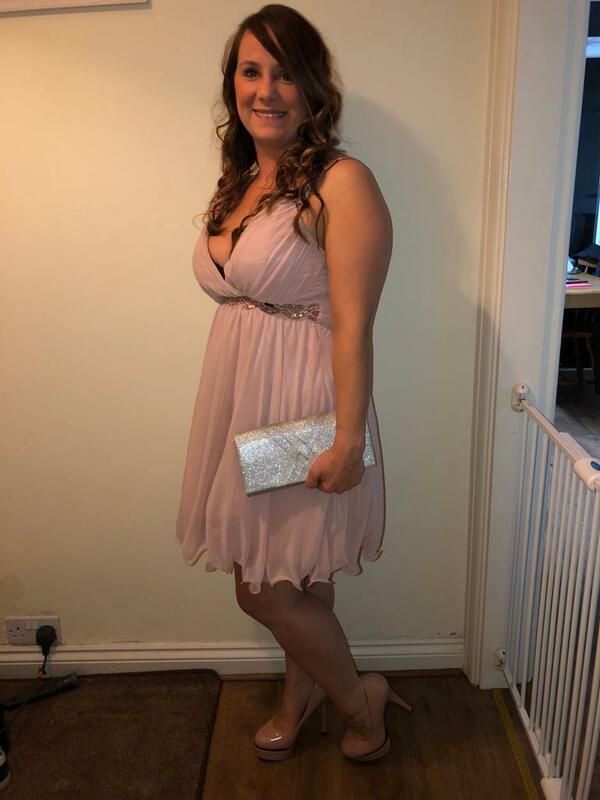 I need to stop worrying and stressing about money, since going back to work after maternity leave and having nursery fees to pay on top of our household bills and mortgage, things can be a little tight each month and I do get stressed about it, and I need to stop as I know we will be OK and have the support of others. I have always had a passion for taking photos, but i’m not very good at getting a decent one. My aim would be to practice different angles and layouts instead of just a photo of the product against the same backgrounds in the same positions. I need to try and keep on top of the house work and keeping it clean and tidy, the house is never dirty but it always looks a mess which really frustrates me. Although we meal plan each week I want to aim to cook from scratch more often as it’s something I really miss. I made butternut squash soup the other weekend and I enjoyed it. Travel more – within reason, we never had a honeymoon but I want to make up for it now Freddie is getting older. I love visiting new places/countries and have got a few on my bucket list to visit. Spend more time together, as a married couple date nights are a very rare occasion but I want to try at least once a month to try and just go out just for a few hours whether for a meal, spa day, shopping just us 2. Read More, I do own a kindle but need to find some new books to read and i’ve read all of them. Do more as a family, days out even if its just a trip to the park. Doesn’t have to be expensive just to get us out the house. Have a scheduled day to go food shopping, at the moment I go when I feel like it, I don’t have a set day to go and the husband always moans at me and then we struggle to find meals to make. Try and put a set amount of money away in my savings account each month, no matter how small. Try and decorate the house from top to bottom and make it more modern to go with the new bathroom. I’ve realised that I use my phone a lot and it would be nice to use my phone less and concentrate on other things more. Wow that was a lot harder than I thought it would be, but I made it. I will keep you posted on how I get on with achieving these. Do you have any resolutions or aims for 2019? I’d love to hear about them to give me even more inspiration this year. One thing I love is clean sheets, I change our bed once a week without fail. I sometimes worry I’m not going to have enough bedding, yet the draw is over flowing with quilt sets. When B-sensible got in contact and offered us to review bedding I jumped straight on their website. 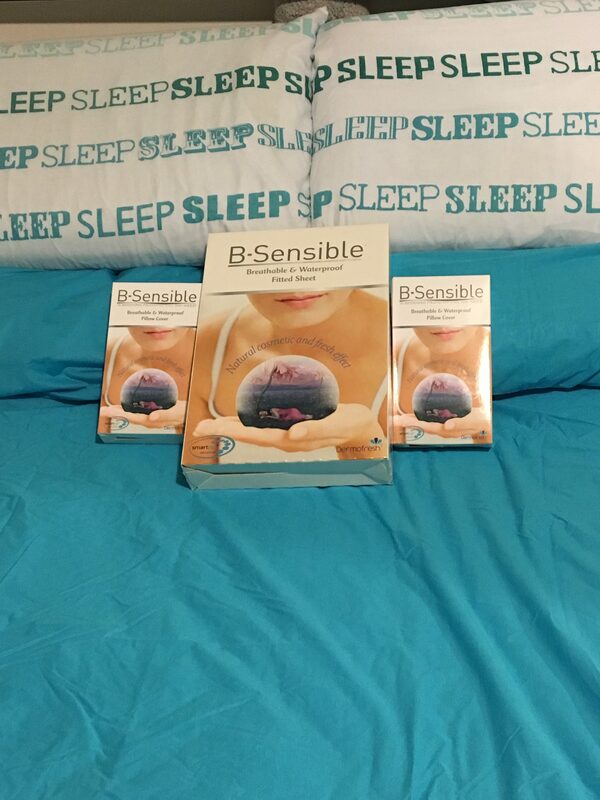 B-Sensible offer a range of 2 in 1 bedding products that are both breathable and waterproof. 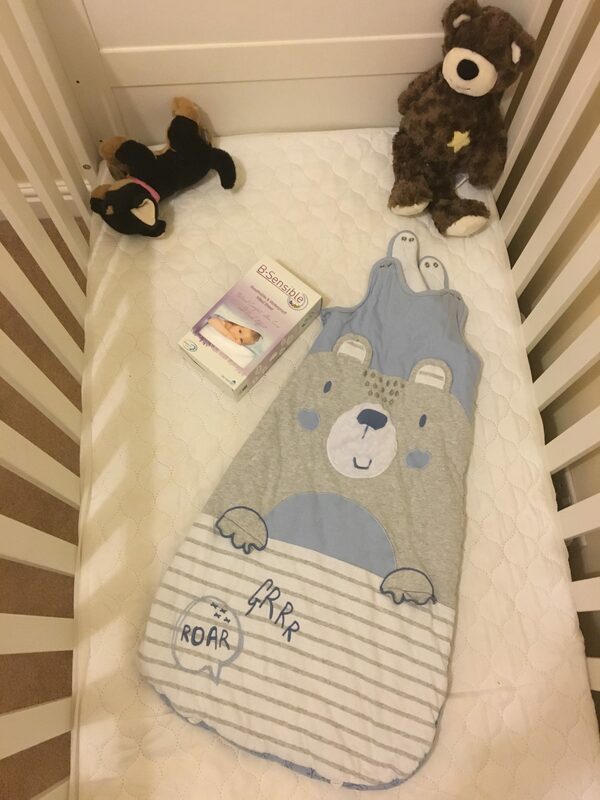 Along with their 2 in 1 bed sheets for adult beds, they also sell sheets for cots, cot beds and toddler beds. I choose the turquoise sheet and matching pillow cases for our bed, they are super soft and wouldn’t know they have a protective cover underneath as you don’t feel it or hear it. Along with bed sheet we also have matching pillowcases, which are also waterproof and breathable. Something a bit different about this pillowcase is that it zips closed, instead of having the traditional fold inside. For Freddie the white breathable and waterproof sheet, this would be perfect for when we start potty training him as if there were accidents in the night it wouldn’t ruin his mattress. Unfortunately I ordered the wrong size so it doesn’t fit his mattress. I would be sure to buy these but they are a bit on the expensive side , if they were cheaper I would buy them and swap all our bedding for this brand. Disclaimer: We received the above products for the purpose of this review. However all thoughts and opinions are our own. Wow, How weird does it feel to be writing and saying 2019? How has everyone’s first week of January gone? Mine’s been a bit crazy but OK so far. This year I aim to be more organised, with general life and my blog. 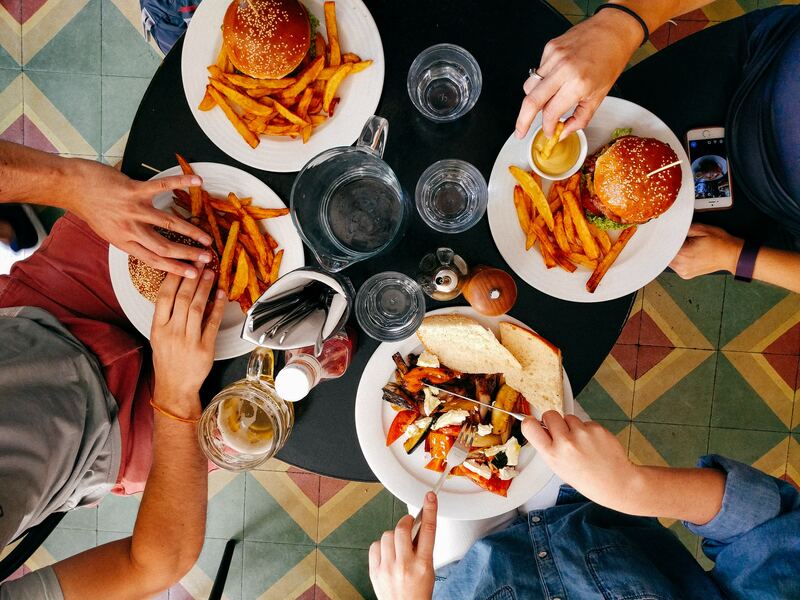 What’s on your plate this week?